Students at the University of Cape Town, and at all other South African higher education institutions, navigate an array of challenges in their daily struggle to obtain an education. Not least amongst these is rising costs – not just of tuition, but of all the ancillary aspects entailed in being at a university. In addition to this, there are challenges of epistemological access, where students struggle to engage with propositional or more abstract forms of knowledge, particularly as they transition between school and university. Moreover, students face the struggle to be heard and to have their point of view, their everyday lived realities, represented in the body of knowledge that they are engaging with and helping to create. The nett result of this situation is wide-scale exclusion, which is a social justice issue. This exclusion leaves everyone in the system the poorer for it in terms of the price we pay for a lack of diversity and the burden students are expected to bear. The theme of this year’s Open Education Week seminar at the University of Cape Town (UCT) was “Open education and social justice: Towards equitable access through participation”. In recognising that many aspects of the South African higher education system are fundamentally unjust, the thematic focus attempted to shine a light on social justice challenges and surface possible strategies (of both the institution and individual academics) which might help to address current inequities. The event also served as the official launch the UNESCO Chair in Open Education and Social Justice, which was recently awarded to Associate Professor Cheryl Hodgkinson-Williams in UCT’s Centre for Innovation in Learning and Teaching in recognition of her long-standing commitment to the field of open education research. 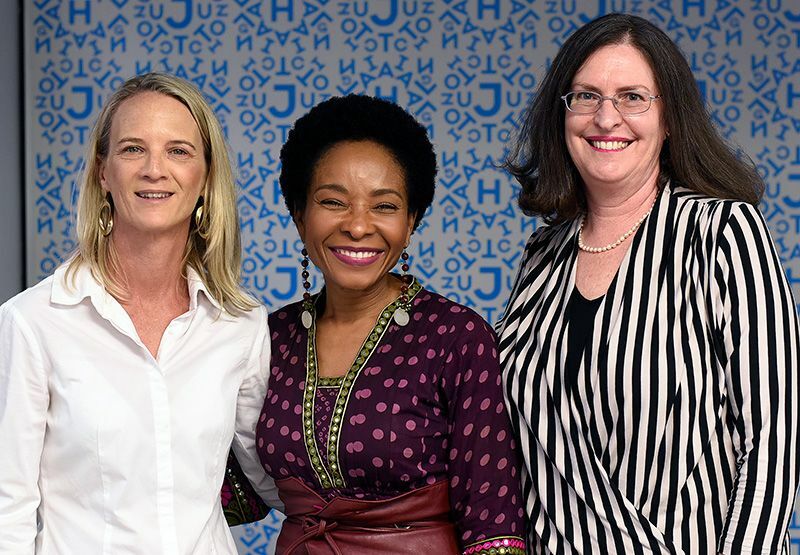 In her opening address <video>, UCT Vice-Chancellor Prof. Mamokgethi Phakeng highlighted the fact that social justice is an issue which the university grapples with on an everyday basis, particularly in relation to the challenges associated with the student protests which have taken place in South Africa over the past few years. Acknowledging the role that open education has to play in the current South African context, Prof. Phakeng highlighted the fact that the institution could not single-handedly address the issue of access to education in South Africa, but much could be done in terms of making the knowledge it produces openly available. In congratulating A/Prof Cheryl Hodgkinson-Williams on the UNESCO Chair award, Prof. Phakeng described the Chair as as having a critical voice in challenging prevailing discourses from the Global North. She also said the Chair’s location within UCT served as a challenge to the institution, particularly in terms of engaging with and interrogating the tools which are currently available to enable not only access, but participation and success. In her inaugural address <video> as UNESCO Chair, titled “Open education and social justice: Value propositions for higher education” <slides>, A/Prof Hodgkinson-Williams spoke about social justice in higher education as the environment that we need to create in order for people to be able to participate equally in society. She highlighted the fact that this is about cultural, economic and political participation, and that open education comes with the opportunity to provide more equitable access to learning materials as well as greater representation in what is being taught and how teaching is delivered. What we are looking for in social justice and education, she explained, is an opportunity to have contextually appropriate materials where we can ensure cultural equality. The presentation <video> by Jill Claassen, Lena Nyahodza and Dr Reggie Raju on “UCT Libraries’ social justice strategy through open educational resources” highlighted the role of open education in promoting lifelong learning and human development as well as innovation and change. Understanding the significance of innovation to support teaching and learning and engaged scholarship for social justice, UCT Libraries has adopted technologies to establish infrastructure for open publishing which values the sharing of open educational resources (OER), including open textbooks. The OpenUCT repository serves as a platform for promoting the sharing of OER, while the OpenUCT Publications platform provides an institutional mechanism for publishing monographs and open textbooks. The presentation <video> on the “Digital Open Textbooks for Development” (DOT4D) project by Principal Investigator Dr Glenda Cox further explored the role of open textbooks in addressing issues of access and representation at UCT. Dr Cox referenced a number of open textbook development initiatives in which educators are exploring new forms of pedagogical and technological innovation, as well as multilingualism and student-centred content creation processes. She highlighted concerns around reward systems which are not currently geared towards recognising innovation in teaching and learning, and the need to address sustainability mechanisms for open content creation. Within this context, institutional support and resourcing is itself a key structural social justice issue in terms of ensuring parity of participation in the emerging field of open textbook publishing. The presentation <video> on “Drawing out of the box: Student-led open textbook development” by Kensleyrao Apajee showcased a student-led initiative to develop an open textbook for Mechanical Engineering undergraduates at UCT. Apajee, who has been the head tutor for Engineering Drawing at UCT since 2017, described how he identified a gap in the visualisation skills of undergraduate students which appears to be compounded by economic disadvantage in instances where school-leavers have not had an adequate basic education. Receiving a grant from the DOT4D project has enabled him to embark on the development of an open textbook which is tailor-made for local context and aims to eliminate the need for private tutoring. The final presentation <video>, “How open and healthy are open educational resources in the Health Sciences Faculty at UCT?” by Gregory Doyle and Veronica Mitchell, provided an overview of the OER initiative run by the Department of Health Sciences Education at UCT since 2008. The presentation profiled the efforts of a number of OER champions producing OER in the faculty, while also drawing attention to challenges related to human capacity, siloed institutional culture, restrictive policies, and changes in leadership and levels of support. The presentation also drew attention to the need for institutional incentives and transformation of the current reward systems to better recognise educators who are doing groundbreaking work in developing and publishing open teaching resources. The Open Education Week seminar at UCT on 6 March was one of 190 events in 23 countries hosted in the week of 4-8 March 2019. UCT is a member of the international Open Education Consortium and has participated in Open Education Week since the 2012 inception of this international event aimed at promoting open educational practices and the use of open resources.